There was a time when Jean-claude van damme was among the most famous movie stars in the world. He is a Belgian bodybuilder, trained in karate from a young age, who used his fighting skills together with his physique to break into the American movie business. Competing in martial arts during his 20s, no one could have imagined he would go on to star in some of the 1980s biggest cinema hits. Some ask what the Best Jean-claude Van Damme Movies are. Well, now in his 50s, he’s still acting, producing, and even bodybuilding. At one point he even had his own reality show following him around. Here are the ten best jean-claude van damme movies, all of which have become cult classics. Van Damme plays a professional boxer living in France. He agrees to lose a boxing match on purpose in return for money from a criminal gang. But it doesn’t go to plan, as he ends up winning the fight. This was bad news as it meant the gangsters wanted him dead. To avoid this fate, he joins the French foreign legion. He agrees to serve a few ears in North-Africa so that he may earn a new identity. The gangsters eventually learn of his location and they send people to kill him. This makes things a lot more difficult for everyone involved. The Quest tells the story of a young pickpocket on a journey to achieve great fortune. He runs into trouble on his way though, being captured by slave-trading pirates. He is rescued from the pirates by an English soldier, who himself enslaves him and sells him back into slavery. He ends up in Thailand where he is taught Thai kickboxing and forced to fight for money. He goes on to fight tougher and tougher people until he wins a huge tournament. With his big win, he hopes someone will buy his freedom. Otherwise, his only hope would be to escape. Van Damme plays a convicted criminal sent to a maximum security prison. While there, he soon realizes that prisoners are forced to fight to the death in one-on-one unarmed combat. This whole thing is done simply to entertain the prison workers. Just like all similar movies, In Hell is set in Russia. He plays an American, who was an immigrant worker until being captured by police. His only hope for surviving his time at the prison is to fight against a series of other inmates. He was sentenced to life in prison without the possibility of parole, so he had nothing to lose by fighting. Cyborg is set in a future civilization where humans and robots are able to merge together. Suddenly, a deadly plague threatened to bring the civilization to it’s knees. While the civilization is battling for it’s survival, a highly skilled fighter goes on a mission to track down and stop a notorious serial killer. The serial killer is essentially a pirate, with a whole crew with him. The move from area to area, killing wealthy people and taking their possessions for sale. It’s technically a post-apocalyptic movie as civilization has already been brought down by the plague in every meaningful way. After her father disappeared in mysterious circumstance, a woman goes on a long journey to find out what happened to him. But it’s a dangerous journey through the American wilderness so she agrees to hire a martial artist to assist and protect her as they search Louisiana for the missing man. It turns out that her father may well have been murdered by a wealthy man who hunts and kills homeless people for his own entertainment. He did so with a bow and arrow, which makes it strangely worse. The movie is so bloody and violent that it almost missed out on the R rating it received. Lionheart tells the story of a French Foreign Legion soldier who went AWOL and fled to America. He ran away from duty in order to look after his brother, who is seriously sick. Now in America, he is met by the problem of providing medical care or his sibling. He needs a lot of money, and he earns that money by fighting in illegal competitions. He not only battles with other fighters, but with the struggle of dealing with family issues, and also with the several other French Foreign Legion soldiers attempting to track him down. There are attempts to deport him and put him on trial for abandoning his military duties at one point. In Double Impact, Jean-claude van damme plays both roles as twin brothers. They were separated at a young age because their parents were killed by Triad gangsters. Many years later, the now adult brother get together for a deadly mission of bloody revenge against those Triad members from all those years ago. They have to go all the way back to Hong Kong because that’s where the whole thing took place. I really can’t get over the fact that he played both characters. I’d be fine with that if the movie was a comedy, but it isn’t. So many of the best Jean-claude van damme movies are outright ridiculous at times. Universal Soldier starred two of the biggest action stars of their time: Jean-claude van damme and Dolph Lundgren. They play two soldiers who died in action during the Vietnam war. As part of a military science experiment, they a brought back to life. The experiment is a success and they become the ultimate soldiers. They are only half human, and half robot. They are controlled by the scientists who brought them back, and who now order them into battle. After a while, certain problems begin to emerge relating to their previous life. Most critics didn’t like the movie, but it’s considered a cult classic now. Few of the best Best Jean-claude Van Damme Movies are as ridiculous as this one. 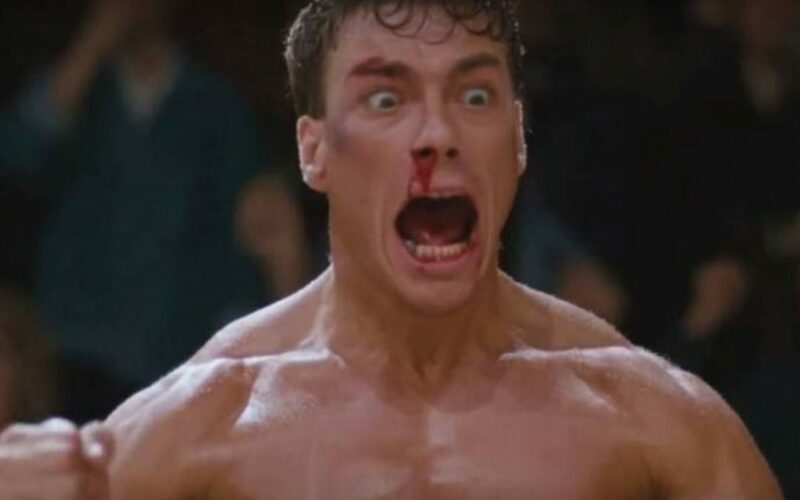 From which this article thumbnail comes, Bloodsport is about an American martial artist who moves to Hong Kong in order to fight for money, hence the name Bloodsport. It was the first time Jean-claude van damme was able to demonstrate his martial arts and acrobatic skill to the American market. The main problem is that the competitions he is competing in are illegal. This means he and other fighters are constantly in need to evade police investigation. His final test is a large Kumite. If successful, he would become the first non-Asian to ever win a full Kumite. There is an all-female cast remake of Bloodsport coming out soon, which is called “Lady Bloodsport. Kickboxer is the classic. Of all the best jean-claude van damme movies, this is the one to watch if only that. After his brother is killed in a fighting competition, a man travels to Thailand in search of revenge. He meets a wise old master who teaches him the mysterious martial art of Muay Thai. After a long while of brutal training, he is strong enough to test his new skill. After defeating several enemies he gets the chance to fight the man who killed his brother in combat. It’s an opportunity he can’t afford to waste. The movie brought in 14.6 million dollars – that was an awful lot of money back in those days.